In Fine Jewelry > Brooches > Show & Tell. i cant id this signature or style it has a very ols style lock wire that swings up after you put the pin in place just under the overhang latch/catch. 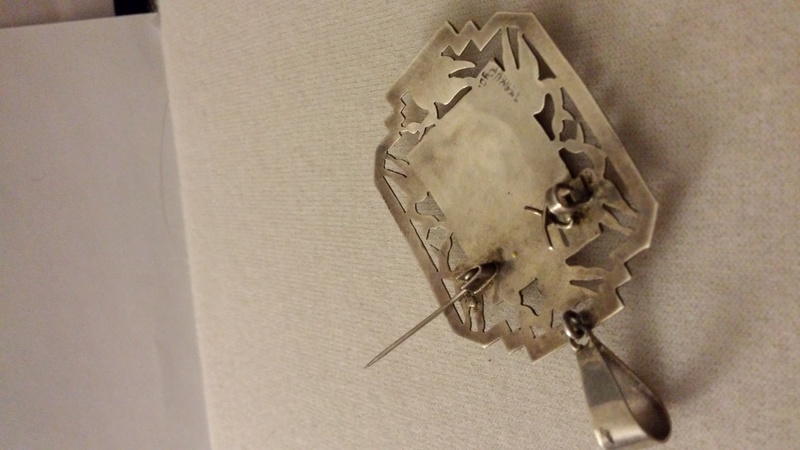 im pretty sure its sterling or a form of 925 950 silver it is definitly worked by hand a steady hand at that,is my feeling due to the jiberish i cant make out on the corner of where initals are carved or stamped in then ive never seen that other stuff but if you stand/view further away a pattern forms like a picaso print does with the dots. it then looks like a grouping of 4 or 5 letters. the front of the pendant/brooch has been cut out of another metal that polishes and looks like Rose Gold or maybe copper i didnt want to hack into it and im out of testing gels. but it definitltly at first glance many years ago when it was being moved from place to place i first thought ALLEN CHEE but this week that went away after i sat and studied it several times for many hours at a time. 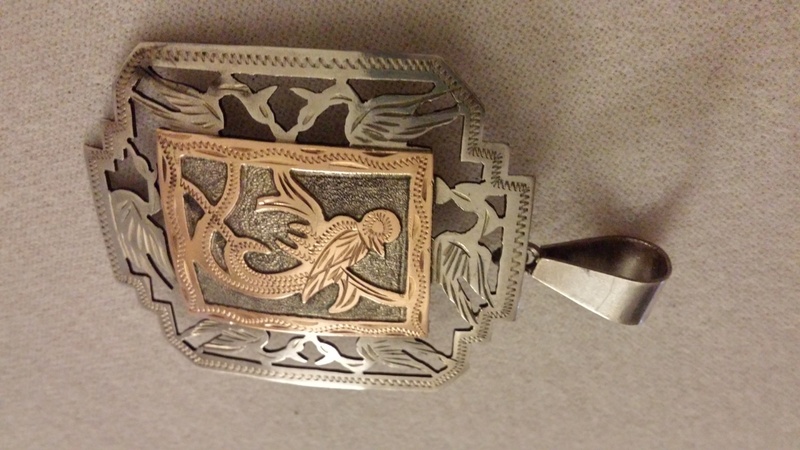 He uses alot of 14kt yellow or rose gold atop his creations in sterling it is of the type as is here mostly he uses more native american symbols like Eagles & hawks w/Floral Native American motifs . but i only have viewed his stuff from 15 yrs ago til now. Hey does anyone want to weigh in on Hanty belt buckel and my piece to maybe link any info either way? i dont remember where i got this piece but i have had it for the past 20-25yrs now. thank you. What does it say in corner on back, there is a stamp? If it says "C"hin"A", please lie to us ! LOL ! I don't think this a Native American piece. The bird is a Quetzal, and is a popular motif used in both Mexican and Guatemalan jewelry. Having spent a lot of time in Guatemala, I can't believe that I missed ID'ing the quetzal ! I'll blame it on the crick I get in my neck from trying to look at all the damned sideways pix on CW ! I have 60x some pictures if a signature looks like a C or D. Then F ? Beautiful item and I think Clementine4 recognized first. I have looked again to see if anyone kd'd this yet and to me the "C" looks like it may be a U or O at the end of the other sig and the bottom one maybe just the Ya??? Regardless, and very frustrating as it may be, it's still a nice piece! I think I see "900" there for the silver content. Agree on Central American origin - Peru, Guatemala, etc.